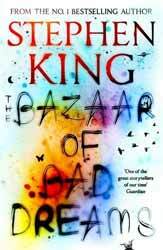 Following on from similar formats Skeleton Crew, Night Shift, Nightmares and Dreamscapes and Four Past Midnight, comes The Bazaar of Bad Dreams – a collection of 21 short stories across 507 pages from the pen of foremost horror and suspense author Stephen King. This is the UK paperback edition published by Hodder Books, part of the Hodder & Stoughton group. I’ve never been a fan of Stephen King in book form. I won’t deny he’s had some good concepts over the years, many of which have been adapted to the silver screen. He has so many bestsellers and followers that if he decided to publish his weekly shopping list multitudes of people would lap it up. However, in my humble opinion, most releases are so long-winded with convoluted descriptive passages that you could probably tear out the middle third and not miss much of the plot. So reviewing a short story collection was always going to be the better option. The truth is this is very much a mixed bunch. For example, Mile 81, which is a story he lost years ago and rewrote, is another supernatural car horror like Christine or From a Buick 8 which belongs firmly in the 1980s. Most of these titles are more based in reality than horror fantasy. Morality tales or experiences with old age and death. Personally, I discovered these ones had little impact, or that they showed early promise but ultimately had no direction. I found myself trying to guess the great revelation, only to be presented with a metaphorical marathon runner who crawls and collapses before the finish line. In other words, many of these stories just stop, making the time invested in them pretty much wasted. However, it’s not all bad news. I enjoyed Bad Little Kid, which is told by a prisoner on death row to his lawyer. Again, there is no pay-off though. It does prove one thing: King is a writer of horror and the supernatural and just comes across as annoying when he tries to tell moral ‘people’ stories (Afterlife is one such example). Obits, which won the 2016 Edgar Award for best short story, is fairly enjoyable and reminiscent of the Japanese story/film Death Note (same idea really). New story Cookie Jar is one of the best shorts here but, again doesn’t make the most of the concept. There’s even a couple of poems, which are essentially stories in non-rhyming poem format.